The smell of seafood is not something I find particularly appetizing, so like many families, we don't eat as much fish as we should. I read an article recently recommending 3 small servings (about 3 oz. each) of salmon or other oily fish with a high level of Omega-3s a week. Because of the health benefits, I'm working myself up to enjoying salmon. :) A few weeks ago I attempted a salmon stir-fry and it was our least-liked meal of quite some time. The meal ended with repeated requests from my 5 year old daughter to "make it the way you usually do next time." We were all in agreement on that front. 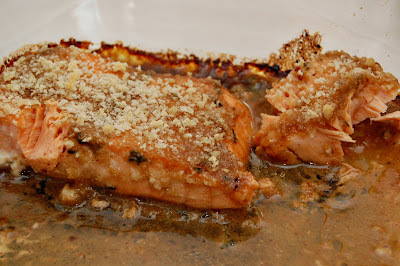 The way "I usually do" salmon is a mash-up of two great recipes: Bobby Flay's Salmon with Brown Sugar and Mustard Glaze and Baked Dijon Salmon from AllRecipes.com. I really like that I can have dinner on the table in about 45 minutes with this meal once the fish has been defrosted (I buy frozen salmon portions). 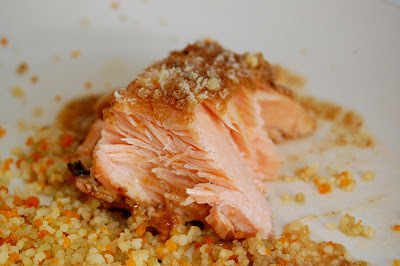 Probably the first salmon recipe that ever had me going back for seconds, I'd alternately title this "Fish For People Who Think They Don't Like Fish." 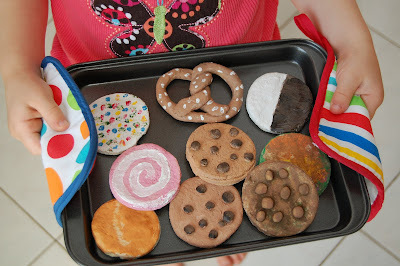 Preheat oven to 400 degrees F. Spray an 8x8 pan with nonstick spray. Mix the sauce ingredients together thoroughly. Place the salmon fillets in the pan, and pour the sauce over them, turning them once to coat. Sprinkle the panko over the tops of the fillets. Bake for 12-15 minutes. Salmon should flake easily with a fork when done. Serve with rice or couscous and veggies.